American Aldes announces exciting changes to its residential heat and energy recovery ventilators and VentZone® Systems. These design advances still have all the features home builders, HVAC installers, and home owners find valuable, such as energy efficiency and healthy indoor air quality, plus simplified installation and greater compatibility with other controllers. American Aldes is pleased to announce the newly designed VentZone® System, the most advanced and effective home ventilation system on the market today. The system combines zoned bathroom exhaust plus whole-house ventilation with a single heat or energy recovery ventilator. For the homeowner, this means healthy indoor air quality throughout the home with extra boost ventilation in the bathrooms as needed while maximizing energy efficiency. Traditional systems ventilate a bathroom in one of two ways; individual fans for each bathroom, or an inline bathroom fan connected to all bathrooms. The former is expensive as it requires purchasing, installing, and ducting several fans plus installing a vent in the exterior of the home for each bathroom. The later wastes energy and can over ventilate a home since all bathroom exhaust is either on or off and does not allow the homeowner to operate ventilation in each bathroom independently. The innovative VentZone® System provides centralized, zoned bathroom exhaust plus whole house ventilation with a single heat or energy recovery ventilator. It gives the homeowner the ability to turn on individual bathroom ventilation as needed, yet only requires one ventilator to provide exhaust for all the bathrooms. 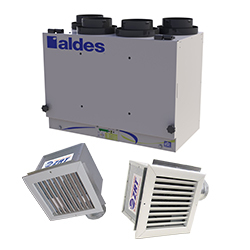 As air is removed from the bathrooms through ALDES’ patented Zone Register Terminals® (ZRT), it it passes through an ALDES heat or energy recovery ventilator (also called an air exchanger). As air is being exhausted from the home, fresh air is also being brought in at the same rate. The air exchanger tempers the incoming air using the energy from the outgoing air without the air streams mixing. This provides balanced ventilation, avoids negative pressure on the home, and improves indoor air quality while maximizing energy recovery. The technology built inside the air exchanger does this in the most energy efficient manner possible to avoid losing heating or cooling energy from within the home. American Aldes’ VentZone® System and Aldes ZRTs are both past recipients of the Innovation Award for Ventilation by the American Society of Heating, Refrigeration and Air Conditioning Engineers (ASHRAE). The company has built upon this already-successful system in several ways. Near universal compatibility with advance dry contact control, allowing direct interlock with HVAC systems and most air exchanger controls. Onboard low-voltage supply to power up to five Aldes Zone Register Terminals (ZRTs). The entire system is designed for ease of installation by a single trade in most cases. Ventzone® kits are available for homes with 2-5 bathrooms. Each kit includes an ERV or HRV, Zone Register Terminals (ZRTs) and controls for each ZRT. Click on the video below for a demonstration. American ALDES is the premier manufacturer of ventilation products and systems for homes, multi-family dwellings, hotels, schools and numerous other commercial applications. Products are designed for superior airflow control, energy-efficient performance, and a healthy indoor environment. American ALDES is a based in Florida and is a subsidiary of the ALDES Group, an international, family owned group of more than 1,300 employees and 17 subsidiaries in 13 countries. More information on VentZone® Systems is available at https://aldes.us/ventzone-iaq .